Does it matter that three neighbourhood plans failed examination last year? With over 2000 neighbourhood plans underway and 240 now passed referendum, are these failures to be expected as the number of plans increases? Or is it, more worryingly, the case that the weight of planning orthodoxy is now being imposed on the voluntary plans of citizens, perhaps driven by the illimitable appetite of developers for legal action against neighbourhood plans? Prior to 2016 only three plans had failed at examination. The neighbourhood plan for Dawlish was produced in 2012 before the regulations governing the process were published and was never expected to pass examination. More striking was the failure of the Slaugham neighbourhood plan, and its associated Community Right to Build orders, in January 2014, where the examiner found its housing site allocations were not compatible with EU regulations on strategic environmental assessments. The Coton Park estate near Coventry failed examination on the grounds that it contained two highways policies that were outside the scope of neighbourhood planning. The local authority revised the plan to exclude these policies and Coton Park went to successful referendum in October 2015. The flurry of neighbourhood plans failing examination in 2016 raised the question of whether examiners were now setting a higher bar for the technical detail expected in citizens’ planning. In Planning magazine (September 9, 2016, page 9), examiner Nigel McGurk was quoted saying it was ‘inevitable that one or two will fail as communities try to push the envelope, or lack sufficient understanding of what a neighbourhood plan can achieve’. The neighbourhood plan for Storrington, Sullington and Washington, near Horsham in West Sussex, failed examination in March 2016 because its site allocation policies were thought not to contribute to sustainable development, due to concerns over the adequacy of the supporting criteria and evidence base. In South Oxfordshire, Berinsfield neighbourhood plan and neighbourhood development orders failed examination in May 2016, principally on the grounds that they did not have regard to national policy relating to green belt. The neighbourhood plan for Wantage, in the Vale of White Horse, Oxfordshire, failed examination in August 2016, because it was thought to be overly focused on protection of environmental assets. Arguably, though, the most high profile failure was a neighbourhood plan that passed examination, although with major amendments. The examination of the neighbourhood plan for Swanwick, in Amber Valley, Derbyshire, called for the deletion of several key policies including the aims and objectives agreed by the parish. Swanwick parish council felt that the deletions meant that the plan no longer represented the aspirations and expectations of the community. When Amber Valley made the amendments and pushed ahead with the referendum, the parish council campaigned against it and the neighbourhood plan became the first to be defeated by popular vote, with 85% voting against it, in October 2016. Less dramatically, the parish council of Alrewas, in Litchfield, withdrew their neighbourhood plan from referendum in February 2016, after the examiner recommended the deletion of policies felt to be crucial in addressing issues identified by the community. Prescribed conditions are met in relation to the neighbourhood plan and prescribed matters have been complied with in connection with the proposal for the neighbourhood plan. Extensive modifications to neighbourhood plans are nothing new, and nearly all plans that went to referendum prior to 2016 were amended, and about half had policies deleted, on the recommendation of examiners. What had changed, perhaps, was the increasingly heated legal context, with the deepening of the conflict between neighbourhood plans and developers, and high profile court cases sounding out victories and losses for the property industry. The successful defence of St. Ives neighbourhood plan in the High Court in November 2016, upholding its ban on new-build second homes and holiday lets, was preceded by the quashing of Henfield’s neighbourhood plan in October 2016, when Stonegate Homes and Littleworth Properties won a judicial review on the grounds that the making of the plan was incompatible with EU regulations. This legal action focused on the criteria and evidence used to make housing site allocations, and the result underlined the need to ensure that policies in neighbourhood plans were robust and founded on impeachable process. In March 2016 the housing and development policies in the Haddenham neighbourhood plan were quashed on the agreement of Aylesbury Vale council in the face of a High Court hearing brought by property company Lightwood Strategic Ltd, thus overturning the decision of its examination and the outcome of its successful referendum. The neighbourhood plan for Loxwood, near Chichester, was subjected to a series of legal challenges from Crownhall Estates since 2014, with its July 2014 referendum result overthrown, its May 2015 referendum postponed, and its final public endorsement in July 2015 unsuccessfully contested in the High Court in January 2016. So the pressure on neighbourhood plans to be litigation-proof, and on their examiners to identify and remedy likely vulnerabilities, may have heightened in 2016, but there might be another explanation for the examination failures. Neighbourhood planning groups had complained for some time of the moderating role played by local planning authorities and consultants who excluded issues identified as important in community engagement on the grounds that they did to meet the requirements of land use planning. A neighbourhood planning orthodoxy was being established through a process of self-censorship by neighbourhood groups and outright exclusion by planning practitioners. A matrix of normalized place shaping policies was emerging, with some level of negotiation taking place, to establish the limits of acceptability in neighbourhood planning policy. It was possible, on the one hand, for St. Ives to push the boundary of land use policy and challenge the market rationalities of housing development with its ban on second homes, while on the other hand, neighbourhoods, like Swanwick or Wantage, were told forcibly that they had strayed over the boundaries of acceptability. Much of the focus of examiners’ scrutiny, and developer’s legal action, has been on the technical detail of assembling and assessing the evidence for neighbourhood planning policy, and on the screening process and documentation of strategic environmental assessments. This raises the bar on citizen planners to demonstrate technical planning knowledge, and it conflicts with the rhetorical intention to democratise planning and open it up to the lived experience of local knowledge. One of the abiding issues for neighbourhood planning has been that it can deal only with matters requiring planning consent. The participative and community-led process would suggest otherwise that neighbourhood plans are effectively community manifestos, and should therefore be free to address all relevant issues, particularly those relating to the planning of public services and infrastructure. Since the publication of the Exeter St. James plan in 2012, neighbourhoods have addressed this conundrum by distinguishing community projects and recommendations from planning policies, and keeping the two clearly separate in the plan. The distinction between planning and other community policies is not always easy to negotiate and separating the two can seriously undermine neighbourhood ambitions. Community aims and objectives were deleted from Swanwick’s neighbourhood plan at the recommendation of the examiner because they read as if they were policy requirements, rather than the aspirations that had guided the policy-making process. The Berinsfield neighbourhood plan failed examination because it exceeded its devolved powers in allocating sites in green belt, but this appears to have been a community strategy to decisively influence the local authority review of green belt, a review the parish had been excluded from. Neighbourhood plans may have wider aims than exerting influence on planning decisions. Despite the restrictions, they are citizen plans, and with the average neighbourhood plan taking three years to complete, and involving exhaustive community engagement, there is a responsibility on the planning group to demonstrate that local views have been included in the text of the plan, and that policies are guided by the vision and specific objectives agreed by residents. 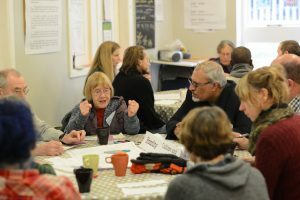 Citizen planning brings together professional and local knowledge and is likely to produce a hybrid of the two, bringing emotional depth and lived experience to the drafting of planning policy. The requirement on neighbourhood plans to contribute to sustainable development has allowed some commentators to make simple distinctions between protectionist plans and those that were pro-growth. Given that elements of protection are central to national planning policy, this distinction appears a little arbitrary, and neighbourhood plans, at the bottom of a hierarchy of planning policies, may serve a residual role, concentrating on issues that other development plans have ignored. Neighbourhoods without developable land, or without a development market, are correspondingly limited in what they can plan for. Wantage neighbourhood plan was failed at examination on the grounds that it did not allocate land, or envisage opportunities for housing growth, and it was criticised as protectionist. The examiner acknowledged that the only developable land in the neighbourhood was already allocated with planning permission. While the policies drafted by Wantage town council lacked the required evidence base, they did not prevent development, and provided policy that would enable growth that respected and enhanced the environment. There is a danger that a professional planning orthodoxy may be imposed on neighbourhood plans as a response to developers’ litigation, to the detriment of local knowledge, the narrowing of interpretations of sustainability and the loss of the democratic inclusivity of citizens’ planning.